French Emblems: Emblem: Ex pace rerum opulentia. Laeva tenet cornu plenum ubere copia. Pax ubi Marte triumphato viget aurea. Athenian Peace leads golden Wealth in her right hand, Her left holds a horn full of fruitful abundance. A fulness of riches swells up, and a joyful abundance of things, Where War has been vanquished and golden Peace flourishes. Parthenopaeus erat puer Arcadiae decus. In the Description of Attica Pausanias writes that in Athens there stood a statue of Peace, carrying her son Plutus; and he mentions it again in the Description of Boeotia, where he writes that it was cleverly crafted by Cephisodotus. Now this is Plutus or Pluto the god of Riches. [p.77] Although Lilius Gyraldus notes that these two are entirely different, he is found guilty of a clear error by no less a judge than Pausanias himself, in whom one reads in the former place Ploutwna paida [her son Pluto], and in the latter Plouton [Plutus], with the same meaning. For in fact it was for this reason that the ancients attributed Pluto to be the god of wealth, that wealth was sought from the very bowels of the earth, indeed from the depths of the underworld itself. For the same reason in Thebes the chief city of Boeotia, we read in the same author that a statue of Fortune, carrying her son Plutus, was set up, the sculptor’s meaning being that good fortune is the mother or foster-child of riches. 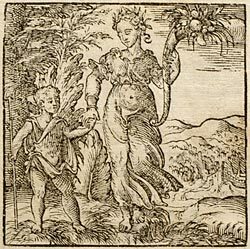 As for the picture: Peace is portrayed as a woman with shining white face, beautiful to look at, crowned with an olive-wreath, in her left hand holding a cornucopia overflowing with all manner of fruits, in her right hand holding her son Plutus, as a straightforward signifier that wealth increases not from war but from the benefits of peace. The boy Plutus meanwhile is portrayed as winged, all of gold, and able to see, for which our witness is Philostratus On Images: for the symbol of Plutus as blind has been left out in this case as being too gloomy. 1. Lilius Gyraldus (Gregorius Gyraldus Lilius or Giglio Gregorio Giraldi), Italian humanist and poet (d. 1552). 2. Amalthea was in some accounts a nymph, who fed Jupiter as a baby with goat’s milk from a horn, as a result of which the horn overflowed ever after with nectar and ambrosia. According to others, Amalthea was the name of the goat itself.